Home » Environment • Things to See and Do • Tourism » Manta season has begun! Wolf Rock Dive are finally getting back out to Wolf Rock after the tough weather during February and the site is going off! Around 40 resident grey nurse sharks are on site with as many as five different shark species sighted in one dive. Leopard shark, tawny nurse shark, wobbegong and spinner sharks. This is a great indicator of how successful a marine sanctuary Wolf Rock is. The fish are thriving and therefore the sharks are too, which all in all equals a healthy ecosystem. 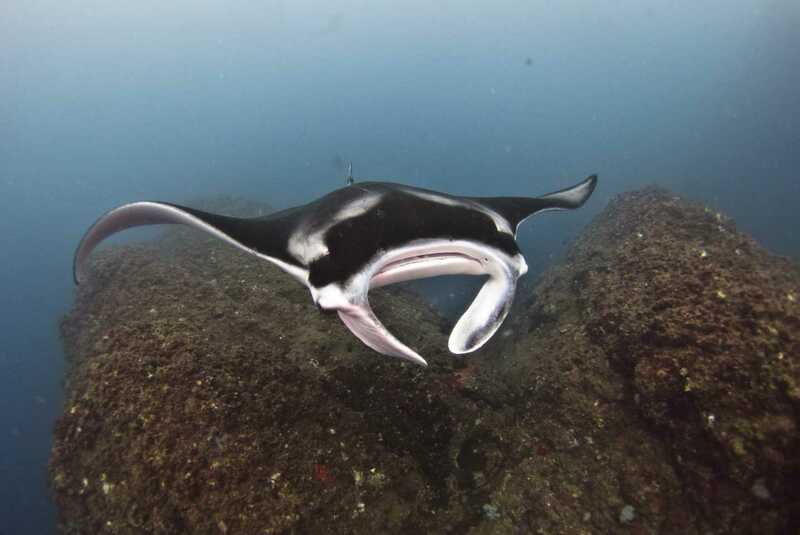 For the next three months it will be likely to see the majestic manta rays on one or two of our cleaning stations. The cleaning station is an area where large fish and rays hover for a while allowing the smaller cleaner wrasse to pick bits of debris from their teeth and gills, even the turtles enjoy getting their shells cleaned. We have several special areas like this on Wolf Rock and have seen five mantas this past week hanging out with our lucky divers.